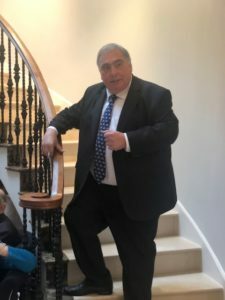 On Friday 15 March, John Flack MEP spoke about a number of animal welfare issues at the Esher and Walton Conservative Women’s Organisation lunch event. 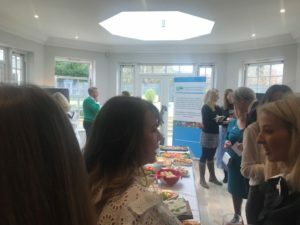 The event took place at the home of the organisation’s Chairman, Elise Dünweber, (Conservative Animal Welfare Foundation Patron) in Oxshott in Surrey. John is the Vice president of the European Parliament’s Animal Welfare Intergroup and spoke on his ground-breaking book’ Animals Can’t Vote But You Can!’which was launched at the joint Conservative Animal Welfare Foundation and Conservative Environment Network joint fringe reception at the Conservative party conference on 1 October hosted by Zac Goldsmith MP. In her introduction before the room, our Patron Elise Dunweber called for a ban on the consumption of dog meat in the UK which was also echoed by John in his speech. 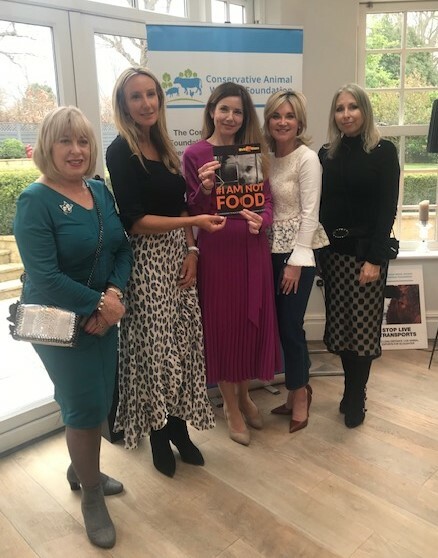 Conservative Animal Welfare Foundation believes that the UK should join other countries including the US and introduce a ban on the consumption of dog meat. This would send a powerful message to those countries that do consume dogs that eating dogs is cruel and should not be tolerated. John urged for animal sentience to be enshrined in UK law when the UK leaves the EU. Action was called to end live exports for slaughter and fattening, an end to foie gras imports and cages for egg laying birds and pig farrowing crates and for Method Of Production labelling to be introduced. John talked on the harmful impact industrial agriculture has on our health,the environment and animal welfare, and the benefits of eating less and higher welfare meat and a move to more plant based options. John talked on cellular agriculture where meat is grown in laboratories. This new cultured meat initiative has been heavily invested in by household names including Bill Gates and Sir Richard Branson. The future of the’ Beyond Meat’ plant based burger was raised, which is now increasingly available in UK restaurants and has been welcomed as a healthy delicious alternative to meat burgers. A Question and Answer session with the audience followed John’s speech and questions included ending non stun slaughter, concerns on the lack of availability of higher welfare products in small express supermarkets and the responsibility of supermarket retailers to provide more higher welfare meat and dairy products in their stores rather than intensively produced lower welfare products. 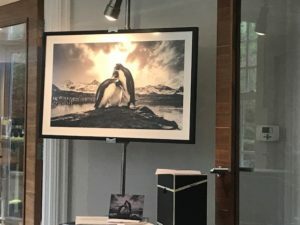 A spectacular limited edition print of wild penguins’ World’s End’ was kindly donated by one of Europe’s celebrated wildlife photographers to help raise money for animal welfare in a silent auction. A raffle of two exclusive House of Commons bottles of champagne signed by the Prime Minister and Rt Hon Dominic Raab MP also took place. “We are delighted that John gave a talk at our local Conservative Women’s Organisation and everyone here today will have a copy of John’s important book. 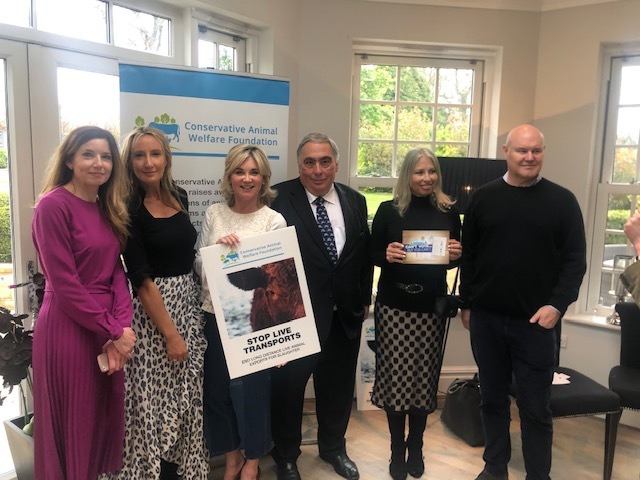 Conservative Animal Welfare Foundation is a grass roots led movement and we want everyone to stop and think of the messages in the book and how we can all take action to help make a difference -animal welfare is of increasing concern to the majority of the public. Our Prime Minister Theresa May recently said that animal welfare is a priority for the Government, and we welcome this and the recent positive announcements to advance animal welfare, including the micro- beads ban, mandatory CCTV in all slaughterhouses, the ban on UK Ivory Sales, increased cruelty sentencing, a ban on third party dog sales, and steps to control and maybe ban live exports when the UK leaves the EU.